Acquiring diesel trucks is fairly straightforward – fleet managers and small trucking company operators alike have been doing it for decades and have the details, including figuring the cost of operation, down pat. But electric trucks? That’s a new ballgame. Electric delivery truck maker Chanje Inc. has teamed with leasing giant Ryder and EV charging systems supplier eMotorWerks Inc. to develop an electric truck acquisition process that Chanje Chief Executive Bryan Hansel insists won’t add to buyers’ stress levels. Ryder System Inc. will serve as the exclusive sales and maintenance channel for Los Angeles-based Chanje, leasing the trucks to operators and providing warranty service maintenance as provided for in individual leases. Ryder also has a unit that works with truck operators to design electric truck charging systems, which are provided through eMotorWerks. Chanje plans to deliver the first of its Chinese-built Class 5 electric delivery vans to Ryder early next month. The company, along with Ryder and eMotorWerks, is showing off the truck in a series of customer meetings in California, with a New York session planned for early November. The two regions are among the most supportive of electric vehicles and are the likeliest early markets for Chanje’s V8070 medium-duty panel van, Hansel said. Chanje can show prospective users that despite a higher purchase price, the Chanje truck’s total cost of operation over a five-year lease is the same as that of a comparably sized diesel, Hansel said. That’s a message that resonates well with fleet operators like Jack Khudikyan, vice president of AJR Trucking. The Southern California company operates 200 Class 6-8 trucks as a contractor for the U.S. Postal Service, and the Postal Service wants its contractors to green up their fleets, Khudikyan said. Chanje hasn’t yet disclosed the truck’s purchase price, but Hansel said the premium over similarly equipped diesel box trucks will be completely offset by operational savings. Fuel savings are a large part of the equation, as electricity for transportation is about a quarter the cost of diesel fuel. The U.S. average cost of electricity for transportation is 11 cents a kilowatt-hour, according to the U.S. Energy Information Agency. At the V8070’s consumption of approximately one kilowatt-hour per 1.4 miles, that means about $7.70 worth of electricity for 100 miles of range. A diesel box truck getting 9 mpg would consume 11.1 gallons for 100 miles. At today’s average pump price of $2.75 per gallon that’s a fuel cost of $30.53. Even with diesel discounted for a fleet’s bulk fuel purchases, electricity is far less expensive. Maintenance costs for electric trucks also are much lower; there’s no engine maintenance or lubrication, transmissions are simple gear reduction devices, and brakes typically last twice as long because much of the slowing is done by regenerative braking, which makes use of the electric motor rather than the mechanical brakes. Khudikyan attended Chanje’s preview in Orange County, Calif., this month. He said he wants to green his fleet but can only do so if it doesn’t add to his total operating cost. The company is buying a number of Class 8 Kenworth trucks with the new near-zero emissions natural gas engine developed by Cummins-Westport, he said, with 40 slated to be put into service on AJR’s routes in 2018. Khudikyan said afterward that he is considering the Chanje panel vans for his fleet maintenance crew but is waiting for Ryder to put together a bid before making a final decision. The V8070’s 100-mile nominal range isn’t quite enough to make it an easy replacement for AJR’s Class 6 box trucks, he said. “But they told us they are looking at a medium-duty 16- to 24-foot electric box truck, possibly for next year, and I’m interested in that,” he said. Chanje’s trucks are built in China on a Chanje-designed modular truck chassis which, unlike most diesel-to-electric retrofits, doesn’t sacrifice cargo or cabin space for the electric drive system. The V8070’s independently controlled dual electric motors are mounted on the rear axle. The 70-kilowatt-hour lithium-ion battery pack is mounted between the frame rails and beneath the cargo floor, and the control electronics are under the short, downward-sloping hood. The truck looks a bit like a Mercedes-Benz Sprinter van but is 3.5-feet longer than the extended-wheelbase Sprinter. Chanje’s trucks are the first electrics to join Ryder’s fleet of more than 230,000 vehicles. The company also is acquiring a number of electric step vans from Ohio-based Workhorse Group and has ordered 2,500 of Workhorse’s W-15 electric pickup trucks, which is scheduled to go into production in late 2018. To handle the trucks, a number of Ryder’s 800 maintenance facilities nationwide will be designated electric truck facilities, with specially trained personnel. They also will have charging stations that early customers can utilize until their own stations are up and running, Nordh said. The initial EV maintenance centers for the Chanje trucks will be in California, New York and Chicago, he said. 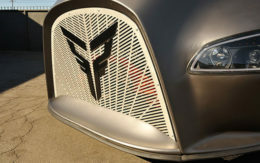 Trucking companies that lease the V8070 and choose a charging system provided by eMotorWerks will get network-connected stations, said Preston Roper, the charging equipment company’s chief operating officer. That will enable them to benefit from grid management services that can provide the most cost-efficient charging times and even ensure that charging is done when the highest level of energy from renewable resources such as solar or wind power is available on the grid. While the demand from electric vehicles isn’t significant now, in could become so as fleet electrification grows in areas where a lot of trucking companies are concentrated, Roper said. Connected charging systems communicate with the grid and can help balance demand by automatically staggering charging times to reduce draw when demand is especially heavy, he said. Other electric truck makers – notably Tesla, scheduled to unveil a battery-electric Class 8 truck on Nov. 16, and Nikola Motors, which is developing a fuel-cell electric tractor-trailer combo and a hydrogen fueling system to support it – also are proposing vehicle-maintenance fuel packages for potential customers. But their vehicles are a year or more away from reality. 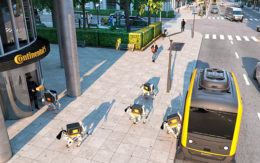 By teaming with Ryder and eMotorWerks and having a truck that’s ready for market now, Chanje “is presenting the market’s first solution at scale for the electric truck,” Hansel said.